Melitta North America, a brand well-recognized for exceptional quality in all aspects of coffee and coffee preparation, today announced a major update to its sustainability efforts – the installation of solar panels at the brand’s state-of-the-art coffee roasting facility in Cherry Hill, NJ. 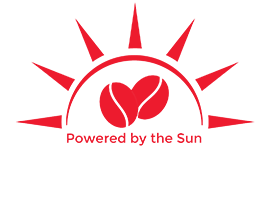 The $1.3 million project will help increase energy efficiencies at the 100,000 square-foot plant, which roasts all coffee for Melitta’s North American needs. This is the most recent substantial update made to further enhance the roasting facility. Over the past several years, significant investments have been made from new equipment being installed for the production of single-serve coffee to plant expansion developments to full modernization modifications. The Cherry Hill location has been in continuous operation since 1964, when Melitta first entered the U.S. coffee market. The plant produces the full range of the brand’s coffee products for major retail chains and specialty stores across the country and is a staple in the Cherry Hill community. New Jersey is currently ranked fifth in the nation for solar power generation, based on data from Solar Energy Industries Association (SEIA). The solar panel installation has been completed and the panels are fully operational, generating electricity for the plant. Melitta North America, a household name in exceptional coffee preparation, today announced the launch of its Signature Series Pour-Over™ coffeemakers designed for customers in pursuit of a better cup of coffee, in the comfort of their own home. 1. Place the Melitta Pour-Over™ cone on top of your favorite mug and insert Melitta paper filter.2. Scoop in your favorite fresh ground coffee to taste.3. Pour hot water (just off the boil) into the cone, fully saturating all the grounds. Melitta's 4 Station Pour-Over Coffee Bar with Porcelain Brew Cones achieved the rank of #2 in Ezvid's wiki of Top 10 Pour Over Coffee Makers of 2016. Compiled with thirty hours of research, this video wiki guide is a broad-ranging, impartial assessment of pour-over coffee maker options available to consumers in the United States. The Melitta 4 Station Coffee Bar is touted for being "designed to provide optimal turbulence of coffee grounds for ideal coffee extraction, allowing anyone to craft the most delicious gourmet coffee possible." -- "10 Best Pour Over Coffee Makers | August 2016." Wiki.ezvid.com. The news comes on the heels of the brand’s recent announcement that its 100% recyclable Melitta Café de Europa gourmet single-serve coffee capsules are now compatible with all Keurig-style machines, including the Keurig® 2.0® brewer. Melitta USA, a brand well-recognized for exceptional quality in all aspects of coffee and coffee preparation, is pleased to announce that its Melitta Café de Europa gourmet single-serve coffee capsules are now compatible with all Keurig-style machines, including the Keurig® 2.0®brewer*. The newly compatible single-serve coffee will be available at retail beginning next month. This new development comes on the heels of a successful 2014 for Melitta. Last year, the brand’s single-serve business experienced significant growth, due in part to steadily climbing same-store sales, strategic geographical expansion and positive word-of-mouth. To meet growing consumer demands, Melitta made substantial investments in new machinery, manufacturing processes and people, nearly doubling employment at its Cherry Hill coffee roasting facility. Melitta’s full-bodied, flavorful single-serve capsules are designed to deliver a heightened sensory experience, reminiscent of the drip brewing process. Consumers can actually see and smell their coffee – 100% premium, high-grown Arabica beans, batch-roasted and ground extra fine – from the moment they remove the cup from its individually sealed freshness pack. The unique capsule design is made with a filter, which allows water to fully saturate the grinds for a bolder, richer cup of coffee. Designed with the environment in mind, Melitta’s single-serve coffees are also eco-friendly and 100% recyclable. Melitta’s Café de Europa Single Serve Gourmet Coffee – available in Classique (medium roast), Vienna Roast (dark roast), Blanc et Noir (a blend of light and dark roasts), Espresso Toscana (extra dark roast) and the newest addition to the collection, Classique Decaf (a smooth, balanced, naturally decaffeinated roast) – is currently available for purchase at most major grocery retailers in the Northeast, including Walmart, Shop Rite, Stop & Shop, A&P, Food Emporium, Pathmark, ACME, Fairway and Zabar’s, among many others in the metro areas of Boston, New York City and Philadelphia. Melitta’s single-serve capsules are also available for purchase on www.melitta.com, www.amazon.com and at other select retailers throughout the U.S. MSRP for a 12-count box is $9.49. The new, Keurig® 2.0® compatible coffee capsules will hit store shelves in May. *Melitta products are not affiliated with or approved by Keurig Inc.
Melitta USA, a brand well-recognized for exceptional quality in all aspects of coffee and coffee preparation, evolves even further into the booming single-serve market with the addition of single cup coffee. The brand this week unveiled customized UpShot™ Solution equipment at its state-of-the-art coffee roasting facility in Cherry Hill, N.J. and is now equipped to produce its own Melitta Café de Europa Gourmet Single Cup Coffee, as well as provide manufacturing options – roasting, filling and packaging services – to third party brands looking to enter the single-serve market. Developed by LBP Manufacturing, Inc., the UpShot Solution features an eco-friendly (composed of 100 percent recyclable polypropylene), single-serve filter that Melitta will fill with coffee. The filter is compatible with Keurig, Inc. and other single-serve brewers and delivers a heightened sensory appeal to the brewing process. Consumers can see and smell their coffee from the moment they open the outer seal. Several Cherry Hill community leaders and executives from LBP and Melitta were on hand to mark the occasion, including Vice President of Marketing Chris Hillman. “We’re excited to bring this premium single-serve option to our Melitta customers and to other brands looking to enter this category,” said Hillman. The installation of this equipment marks another major update to Melitta’s Cherry Hill facility, following a $10 million modernization completed in 2011. The brand’s coffee roasting plant has been in continuous operation since 1963, when Melitta first entered the U.S. retail coffee market, and it produces the full range of Melitta coffee products for major retail chains and small specialty stores across the country. At the ceremony, Hillman continued, “The installation of this state-of-the-art equipment is a significant addition to our facility – one that will support future growth, partnerships and continued innovation on behalf of Melitta.” Hillman also gave thanks to the brand’s employees, praising them for their continued hard work and excellence in production. The new Melitta Café de Europa Gourmet Single Cup Coffee is available in four varieties – Classique (medium roast), Vienna Roast (dark roast), Blanc et Noir (a blend of light and dark roasts) and Espresso Toscana (extra dark roast) – at www.melitta.com and will be available at all major grocery retailers in the Northeast, and other select retailers throughout the U.S., in the coming months. A 12 count box will retail for $9.49. 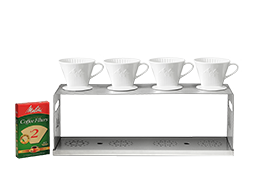 For more information on the Melitta Café de Europa Gourmet Single Cup Coffee and a demonstration, please visit: http://www.youtube.com/watch?v=jaOZFs6Qjpw. Melitta, a brand well-recognized for exceptional quality in all aspects of coffee and coffee preparation, expands its selection of single-serve products with the debut of the Melitta JavaJig™: a reusable, single-serve Melitta filter system. The completely customizable offering provides coffee lovers an easy, cost-conscious and environmentally sound alternative to prefilled single-serve coffee capsules and further secures Melitta’s position as the worldwide leader in coffee filters. Customizable: The Melitta JavaJig provides unlimited variety and brew strength control. Simply choose a favorite coffee or tea, and then adjust fill levels to taste. The Melitta JavaJig filter system allows for a rich, bold cup of single-serve coffee.Economical: A cup of coffee made using the Melitta JavaJig costs approximately 50 percent less per cup, when compared to using prefilled single-serve coffee capsules.Environmental: The Melitta filter system is reusable, and the paper filters are compostable. The cup is also BPA free. The hottest trend in gourmet coffee? The pour-over. It’s not a new way of making coffee, but rather a time-tested method gaining newfound appreciation. Even hotter? 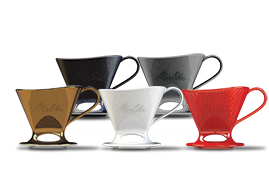 The newest addition to Melitta’s extensive pour-over line-up, the Thermal Pour-Over. Dating back to Melitta Bentz – who in 1908 invented the two-part filter system – the hand-crafting of coffee in a simplistic way creates a bright, clean cup of coffee. Aficionados have proclaimed the pour-over the best method ever devised to make a cup of coffee – simple, convenient and delicious. Preparation consists of a cone, lined with a Melitta coffee filter and filled with ground coffee, sitting atop a coffee cup. Hot water is slowly poured by hand over the grounds and delicious, fresh coffee drips into the cup below. The cup is clean, rich and to be savored. The new Thermal Pour-Over – with its sleek, stylish stainless steel carafe – is an elegant, yet equally convenient addition to Melitta’s existing pour-over collection. The current product portfolio includes the Ready Set Joe and an assortment of Porcelain Pour-Overs. The Thermal Pour-Over holds eight cups of hot coffee and keeps it warm for hours, making it ideal for intimate dinner parties, family breakfasts or book club gatherings. Melitta’s Thermal Pour-Over retails for $49.99 and is available at specialty retailers and online at www.melitta.com. Pour-overs are all the rage these days, and Melitta – the inventor of this now classic coffee-brewing method – offers a refined twist with its line of porcelain pour-overs. Thanks to trailblazing German housewife Melitta Bentz – who in 1908 invented the two-part filter system – the pour-over is time and time again named one of the best methods ever devised to make a perfect cup of coffee. Preparation consists of a cone, lined with a Melitta coffee filter and filled with ground coffee, sitting atop one’s favorite coffee cup. Hot water is slowly poured over the grounds and fresh coffee drips into the cup below. Melitta offers several porcelain options – elegant, yet equally convenient alternatives to the single-serve Ready Set Joe – in its distinguished line-up of manual pour-overs. Perfect for larger quantities of handmade coffee, the stylish Porcelain 6 Cup Pour-Over Coffeemaker is ideal for parties and larger gatherings. For more informal, intimate get-togethers, the Porcelain No. 2 Pour-Over Filter Cone prepares one cup of freshly brewed coffee at a time, and the Porcelain No. 4 Pour-Over Filter Cone, one to six cups. Both filter cones can be used atop mostcoffee mugs or carafes. Melitta’s Porcelain 6 Cup Pour-Over Coffeemaker set retails for $39.99. The No. 2 Pour-Over Filter Cone and No. 4 Pour-Over Filter Cone both retail for $19.99. These items can be found at specialty retailers and online at www.melitta.com and www.amazon.com. An expanded line-up of manual pour-overs from Melitta will continue rolling out for fall 2012. It seems a coffee drink is introduced daily, one with more whipped cream and syrup (and calories). But, the real news in coffee is a new appreciation of coffee pure and simple and the rediscovery of the manual drip method of brewing. Coffeecognoscentihave rechristened the technique as “the pour-over,” and say there is no better way to make a cup of coffee. The pour-over started showing up at independent coffee houses that wanted to provide a fresh, perfectly brewed single cup of coffee at any moment throughout the day. Preparation consists of a cone – lined with a filter and filled with ground coffee – sitting atop a coffee cup. Water is poured manually and slowly over the grounds and coffee drips into the cup below. A pour-over is made in front of the customer, often right at the table. It is the latest coffee obsession, but the method dates back over 100 years when a German housewife named Melitta Bentz resolved to improve the taste of coffee, which at the time was a gritty, murky beverage, the result of putting grounds in a cloth bag and dangling it in hot water – the method of the day. She devised a paper filter, set it in a brass cup in which she had punched holes, and filled it with ground coffee. She then poured water over the grounds, and coffee – clean and clear – dripped into a drinking cup below. Melitta Bentz’s improvement was so revolutionary she founded a company in 1908: Melitta, the world’s first mega-brand in coffee. Long called the drip method, her way of making coffee is now dubbed “the pour-over,” and it’s all the buzz again. Today’s technique remains just as Melitta Bentz invented it. It’s low-tech, utterly simple and guarantees a great tasting cup of coffee every time: fresh, clean and never overdone. There is no over-brewing or prolonged heating that breaks down coffee’s intense flavors. Not only have top cafes added a pour-over to their menu, but Starbuck’s announced it will be doing the same. Pour-over coffee bars are showing up in restaurants, like Maialino, the latest eatery of famed New York City restaurateur Danny Meyer. Even Ben & Jerry’s has borrowed the name for a dessert featuring a shot of coffee poured over a shake-like concoction. To properly make a pour over, water is poured over the grounds in a swirling motion. The grounds should not sit in water, and it takes about a minute to pour the water in and extract the coffee flavor. Water temperature should be just below boiling, say the coffee experts at Melitta. Also, pour-overs are universally made with extra-fine grind coffee, like those in the premium category, such as Melitta’s own 100% Arabica Café Collection. The method and the equipment are the same for commercial establishments and for home preparation. Melitta offers a single cup brewer called the Ready Set Joe, sold at grocery stores and www.melitta.com. Sales, according to Chris Hillman, Vice President of Marketing at Melitta USA, have recently taken off. “Coffee lovers now realize that one of the best ways of making coffee is also the easiest and least expensive.” Ready Set Joe comes boxed with a filter cone, filters and mug, either a ceramic or travel version. Price is $5.99. Melitta also offers six-cup and ten-cup manual coffee makers utilizing the pour-over method. For information on brewing coffee, visit the Brewing Tips section ofwww.melitta.com or http://www.youtube.com/watch?v=0xvAsGtk4cc. Melitta Bentz began the tradition of coffee perfection during 1908 in Germany. She invented a filter drip coffee-making method that released full-bodied flavor and eliminated bitter substances and coffee grinds – by experimenting with a piece of notebook paper. Tearing a page from her son’s book, she devised a two-part filter system to prevent the grounds from getting into the water. In doing so, she created one of the world’s most enduring inventions, and likely, one of the most frequently used. The paper filter is an idea so successful that nothing has supplanted the concept in home coffee preparation, though Melitta has continued to make countless advances in its more than 100-year history. In addition to continually innovating coffee filters, Melitta is answering higher consumer demand for environmentally sound goods by offering coffee filters made of bamboo, a highly renewable resource. These filters feature micro-fine, flavor-enhancing perforations that release coffee’s full flavor, while keeping impurities out, for a rich-tasting cup of coffee. Furthering its eco-friendly practices, Melitta works with the American Forest Global Releaf program on an ongoing basis, continuing to support efforts to keep forests flourishing and plentiful. Melitta has also taken significant steps to be energy efficient and reduce waste in its manufacturing process. Melitta’s Bamboo Coffee Filters (#2 and #4 size) retail for $3.99 and are available at most major grocery retailers nationwide and online at www.melitta.com and www.amazon.com. Melitta, a brand well-recognized for exceptional quality in all realms of coffee preparation, recently added a collection of premium soft coffee pods to its extensive selection of single serve products and is further expanding its offerings with the addition of two new roasts: Sumatra Blend and Colombian. Melitta single serve coffee pods provide an American audience – increasingly sophisticated about coffee – a convenient way to bring the flavor of Europe in every cup. True to its European heritage, Melitta sources only premium, high-grown coffees from the finest coffee-producing regions of the world. These top-quality, hand-picked beans are then batch-roasted and ground extra fine, releasing the full elegance of the coffee’s flavor. The resulting brew is always rich and never bitter. The new Sumatra Blend is a dark roast with a big, bold flavor; the Colombian is extremely rich, full bodied and balanced. These soft pods are specially designed to fit all Senseo® and Hamilton Beach® Pod Coffeemakers, including the new Stay or Go® Personal Cup™ Pod Coffeemaker. This Hamilton Beach machine brews up to 14 ounces of coffee into a standard coffee cup or travel mug. Other features include the ability to brew eight ounces of coffee in under three minutes, a dishwasher-safe removable brew basket (for quick and easy cleaning) and one-touch start with auto shutoff. Melitta single serve soft coffee pods – Dark Roast, Medium Roast, Decaf, Sumatra Blend and Colombian – are available nationwide at all Walmart stores, major grocery retailers and online at Melitta.com and Amazon.com. Dark and Medium roasts contain 18 coffee pods each; the Decaf, Sumatra Blend and Colombian roasts, 16 coffee pods. A nationwide rollout to major grocery and specialty retailers will continue into the summer. The history of coffee would not be complete – or coffee as good – without the contributions of Melitta Bentz, inventor, innovator, entrepreneur and mother. Millions of people owe her a moment of thanks each morning. Without her idea and the resourcefulness to make it happen, coffee might not have become one of the world’s favorite beverages. She literally changed the world of coffee drinking, one cup at a time. Coffee was first developed as a hot drink in the 11th century on the African continent, but it wasn’t until hundreds of years later that it made its way to Europe and hundreds of years more before it was brewed at home. At the dawn of the 20th century, the method of the day was to place coffee grounds into a cloth bag, tie it with string and submerge it in a pot of boiling water. The result was cloudy, bitter coffee with oily, mucky residue in every cup. Nonetheless, Melitta Bentz, a German housewife, saw coffee’s beverage potential. Her premise was simple: cleaner coffee will taste better. Her innovation was equally simple, though revolutionary. She punctured a brass pot with several holes, took a piece of blotter paper from her son’s schoolbook and improvised a two-part filter system. And thus, the pour-over was born. After receiving a patent for both the filter and the filtration paper, she established the Melitta Bentz Company in 1908. With that one goal – to make coffee taste better – she transformed coffee consumption. Her drip method of making coffee is still one of the most widely used brewing methods in the world. For over 100 years, the Melitta brand has dedicated itself to providing the ultimate coffee experience with its gourmet coffees, filters and coffeemakers – everything needed to make a perfect cup of coffee. 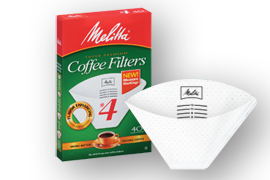 Melitta filter consumers are loyalists, and its coffee lovers, passionate. The brand is the world’s largest supplier of coffee filters and is available in nearly 90 percent of supermarkets in the United States alone. Melitta’s ever-expanding line-up of premium coffees (whole bean, extra fine grind, Fair Trade Organic and single-serve coffee pods) is also available nationwide, as well as online at www.melitta.com and www.amazon.com. For over 100 years, Melitta has dedicated itself to providing the ultimate coffee experience with its premium line of coffee, coffee filters and high quality coffee makers, bringing European indulgence to life. The company was founded in 1908 by Melitta Bentz, after receiving a patent for her coffee filtering system consisting of a filter and filtration paper. The filter system was the first to successfully remove coffee residue in the brewing process, revolutionizing the way coffee was brewed. 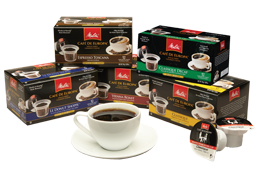 Melitta USA, Inc., part of the privately held Melitta Group in Minden, Germany, is headquartered in Clearwater, Florida. Melitta USA produces coffee and filters in North America and markets the line in the U.S.
For more information, visit www.melitta.com. Follow the flavor at Facebook.com/MelittaUSA, Twitter.com/MelittaUSA and Pinterest.com/MelittaUSA. For media inquiries, or to receive a press kit, please email our media contact Shannon Burton at SBurton@fwv-us.com.